Puerto Natales, 칠레의 야간 하우스 | 호스텔월드에서 예약하세요. 'Hello and welcome to the world's end. We are happy to help you on this unforgettable adventure'. Yaganhouse is considered as the best property in the city and yet to be a great founder of sustainable tourism in the zone. It has a cozy environment, attractive, unique and safe for all kind of travelers. It is located in the center of Puerto Natales, the most cosmopolitan and picturesque city in Chile, where cultural richness and customs keep intact. Yaganhouse is not just a place to spend the night but to experience a moment of unforgetable tranquility as well. To reach this, we have new comfortable beds, new mattresses as well as sheets and cover beds made of high quality materials, clean and confortable rooms. We run a travel agency where we provide all the information you need to know; bus tickets to Torres del Paine, Calafate, Ushuaia, Punta Arenas, tours, excursions and more. 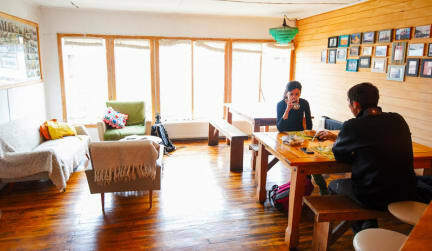 The property has been built using highly natural materials, native, such as walls made of straight-grained wood and isolating materials, central heating, solar panels (first system in Puerto Natales), low energy consumption, recycling system. We are constantly promoting alternative energy systems (natural air ventilation, heating, sunlight), considering its natural benefits, we have the green stamp quality and ecological rules for human beings benefits and environment. Likewise, we offer tranquility for all the passengers of the property, since Yaganhouse complies the environmental regulations of security, being transparent regarding the amenities we offer, providing a high quality service which guarantees, among the wide offer on different properties on the market, based on clear and objective parameters. Another important aspect we are concerned about has to do with the respect that nature deserves biodiversity, culture and local traditions as well as the support of sustainable development of the zone. In the coffee-bar, you will be able to have a welcome drink, it is such a good place to share and meet other travelers. We are always available to help you in your trip and we also have all the experience to provide the best advice in Torres del Paine, since we are passionate on Patagonia and travelers like you! We have the best unforgettable stay at the world's end!